Street Outlaws Unveiled Their Twin Turbo Kamikaze Chevrolet El Camino! Boy does it feel good to take a look at a brand new car that has just been unveiled, something that warms the hearts of each and every car fan worldwide. Most often, people wait for months and months until they see the car for the very first time. Whenever we mention Street Outlaws, the first thing that comes to our minds are the amazing and one of a kind cars that they make. Hereby, in this video we take a look at yet another amazing car that they have just unveiled, the Kamikaze Chevrolet El Camino! 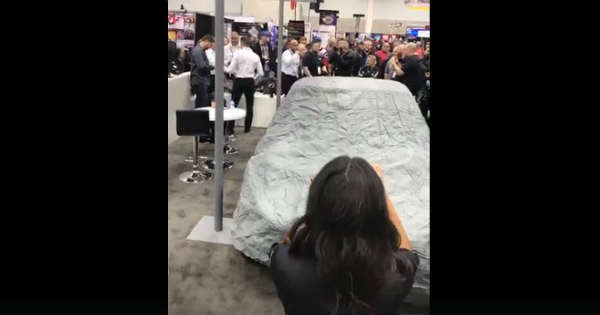 Everyone was really excited at the PRI car show and everyone had their phones in their hands and was filming all the action. After a short talk and getting the people known about the car and some of the amazing features it has, it was finally time to take the cover off. Once they did so, we exactly saw what is under the hood, and we could have clearly see it hence there was no hood at all. Yes, the car`s front body was taken out, which was the reason how this Chevrolet El Camino got its name, the Kamikaze. The fans went crazy about the car and every one there loved every spec about it. Even though we do not see it in action, we are all sure that it is absolutely amazing. What do you think, is this one of the most unusual cars that was made by Street Outlaws?